Looking for a great travel experience at a low price? Check this latest offer from Cebu Pacific. 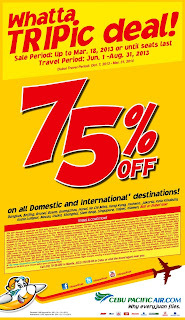 The budget carrier, the largest airline in the country has just announced a new seat sale promo offering as much as 75% discount on all domestic and selected international destinations. The travel period is from June 1 to August 31, 2013. Tickets can be purchased at Cebu Pacific website, www.cebupacificair.com or at their ticketing offices and payment centers. The promo is valid until March 18, 2013 or until promo tickets are sold out, whichever comes first. To be able to save money and other resources, it is highly advisable to plan ahead for your travel. For example, it would be good to know in advance the dates of holidays for the year. Having that information will help you maximize your vacation time. The good thing is that the Philippine government releases schedule of holidays for the upcoming year. See the schedule of Philippine holidays for 2013 in the link below. Last August 2012, Ninoy Aquino Internartional Airport (NAIA) Terminals 1, 2 and 3 began charging the terminal fee while you book your ticket. Mactan-Cebu International Airport (MCIA) implemented a similar policy starting this month. The new procedure has several advantages such as saving time in lining up in the airports' terminal fee booth. The disadvantage though is when you don't use your ticket. You will forfeit both the airline fare and the terminal fee you didn't even use.